We perform tests on hundreds of systems and a multitude of platforms in our F.I.T. Lab to give our customers confidence that our drives will work in their systems. Seamlessly migrate your current system to your new Western Digital drive using Acronis True Image WD Edition cloning software, available as a free download on the WD Support site. This software enables you to copy all your data to a new drive so you don't have to reinstall your operating system to get all the benefits of a new drive. Pros: This bad mother lasted me five years, 2 months and 29 days. It lasted through being within 50 GB of full, for three and a half of those years. This card got put through the ringer, and it kept on kickin. This card held all my dirty secrets, and all my happy moments. For what I paid, I got more than 100x in value from my purchase. Cons: Well, I guess it dies eventually. Pros: - Good size for the price. Cons: - Only lasted just past the 2yr warranty. Other Thoughts: WD is a major brand, is known for reliability, and generally puts out a good product....maybe I drew a short straw on this one? Am replacing it with a 1TB Black series. We are sorry hearing your experience with the WD Blue Desktop Hard Drive and thanks for your time providing this feedback. The best practice is to run diagnostics with Data Lifeguard Diagnostics for windows by connecting the drive on a different SATA port or as a secondary drive on the computer when a drive is behaving abnormally. You can refer to the link mentioned below and follow the instructions to test the drive using Data Lifeguard Diagnostics for Windows. As you are considering the WD Black Performance hard drive, please know that WD Black hard drives are designed for desktop PC and power users who demand performance. The WD Black drive features a dual-core processor that offers twice the processing capability as a standard single-core processor to maximize drive performance, with 256MB of cache on 4TB and 6TB models, WD's Dynamic Cache Technology improves performance in real time to allocate and optimize cache between reads and writes. Helps reduce system-induced vibrations from other components, optimizing performance and reliability. We have placed a link below provides more information about WD Black Performance hard drive. 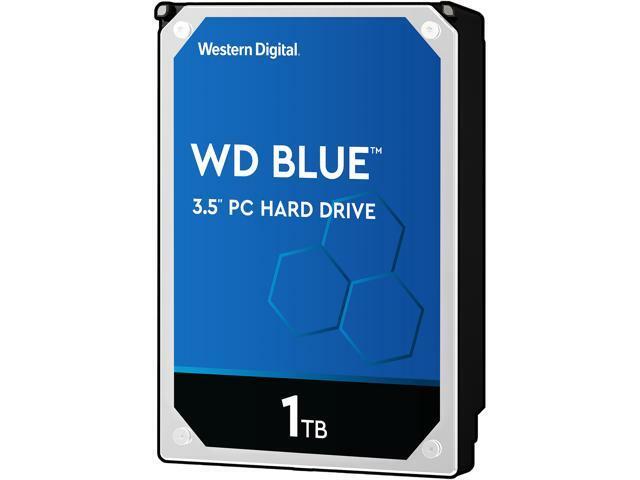 We would like to follow-up with you to help discover the root of your WD Blue hard drive’s abnormal behavior in order to provide a positive resolution to your experience with Western Digital. You can contact us by phone or email from the link given below with reference to Newegg review. Other Thoughts: I bought this to supplement my boot SSD and to store my Steam library. It works great with decent read/write speed. However, I underestimated just how much storage games require. If I were to buy again, I would probably get at least 2 TB of storage. Cons: 7200rpm catches the eye but my WD blue 2tb 5400rpm actually loads games a few seconds faster. Other Thoughts: It's worth it to spend more on an SSD or m.2 if being used for Operating System. This drive is perfect for storage but dont buy it over the 5400rpm because of the rpm only. The 2tb Blue 5400rpm is larger, loads games faster, and can be found for about the same price. Don't forget to defrag every so often. Pros: It is what it is...Have had it for a few months without any issues. Other Thoughts: I will change this review if something does occur. Recommend only to those that require slow speed storage at a cheap cost.